Podcast: Could Bitcoin and Blockchain Bring Stability to Currency? In this podcast, we talk about instances when central authorities mismanage national currency and how cryptocurrencies like Bitcoin could bring stability. Subscribe to the Chain Reaction podcast on iTunes, Google Play, or Stitcher. TYLER: Welcome to the Chain Reaction Podcast. TYLER: That’s right! So who are we and what are we doing here? My name is Tyler Jenks. TYLER: We both work at Very. Very is a software consultancy based out of Chattanooga, Tennessee. We specialize in application development, design, product development, and we are starting to get pretty deep into blockchain development as well. We’ve been around for six and a half years now. We were founded in June of 2011, and we’ve been just growing ever since and are sort of in love in what we do. TYLER: So blockchain. Blockchain is a really interesting topic. There are quite a few different podcasts that are out there. It’s a confusing topic. There are so many different people talking about it now. People regard it as this thing that is supposed to fix everything — that you can build any sort of app on the blockchain. The reality is, it’s not really true, but there are some really amazing things happening. We would like to cover some of the things that are going on. But first, a little bit about us. So again, my name is Tyler Jenks. The reason I care about this stuff and I started Very a number of years back, it kind of goes back to my college years. So I went to a place called Babson College, which is based in Wellesley, Massachusetts. What’s unique about it is that it’s a small school, about 1,700 undergrads while I was there. It’s touted as number one in the world for entrepreneurship. So it’s a great business school in general, and it generally ranks pretty high across colleges in the United States. It is number one in the world for entrepreneurship. What does that mean. They teach people to be entrepreneurs, they teach entrepreneurship. From day one, you’re starting your own businesses, running them with your classmates, and your professors are there helping. EMILY: That’s where you met Ben and Jesse, right? TYLER: That’s right. So two of the other partners here at Very were classmates of mine at Babson. And actually, Jesse, I met even before then because he was on the track team there. And I was looking at Babson to run track, and so when we were in high school — he was in Connecticut, he grew up there and I grew up on Long Island — and it just so happened we were visiting the school at the same time during high school. We hit it off really early, and I didn’t have any idea that we would become really close friends or anything, and certainly not business partners in the future, but that was the case. But anyway, while I was at Babson, trying to figure out what I wanted to do, I knew I wanted to get into entrepreneurship. After about a year there, I was pretty much sold on it, but it’s hard to know what you want to get into, specifically. And Facebook had just really started happening on campus when I was a freshman. So it was about a year old and had kind of blown up. Youtube was already quite big, and there were all these really interesting phenomena happening online. But I was just Googling around my sophomore year, I remember it clear as day, I was sitting at my desk in my dorm and stumbled across a blog called Robotic Nation. It was done by a guy, his name is Marshall Brain, who founded HowStuffWorks.com, which I didn’t know at that time — or maybe it happened a little bit afterwards — they were sold to Discovery for like $150 million, and it was really famous. One of the things on the blog was a short story that he wrote called “Manna.” The whole concept is — it’s just a little sci-fi story about an artificial intelligence program that was designed specifically to help manage a fast food restaurant — a burger place. The people that are working there, they put on these headphones and the software tells them what to do. Basically step-by-step throughout the day, just sort of micromanages them and tells them: okay, so now you need to man the grill and flip burgers, and now you need to go into the closet, go get the mop, go into the bathroom, do it. And so you know, just step-by-step guides everybody through it, and it becomes more and more sophisticated over time and in the story, the fast food chain becomes this gigantic enterprise. Long story short, it creates all this great value, and then this sort of dystopia in the world comes about as a result of it. And then, at the very end when all this technology has really sunk into the world, there’s this kind of techno utopia that appears. Everything’s kind of perfect because of all these amazing technologies that have come about. And it really kind of struck me. The way it was presented is you know, this very logical progression of what happens as certain technologies take hold and the kinds of problems they solve, the kinds of problems they create and how it kind of snowballs into this really remarkably different world. And then shortly after that, I’d stumbled on Ray Kurzweil’s work, he wrote a book and published it that year called The Singularity is Near. A lot of people referenced Ray Kurzweil and this concept of singularity, which is what he started writing about in 2005. It was a very similar thought process, a very similar progression as these various technologies take more and more hold, and they become more and more ubiquitous around the world — and not just in rich countries but everywhere. It doesn't matter if you’re in the middle of Zimbabwe, if you’re on a farm, or if you're in the middle of downtown Manhattan, everybody has basically the same access to the same universal knowledge. And his conclusion is also that we reached this point of total utopia essentially, after all these things finally break down these fundamental problems. So this kind of stuff got me interested in the tech side of things. I was not a technologist, I didn’t study anything technical. I did have some programming language background. I loved Microsoft Excel, I took a class in C# at the time, and a few things like that. But I knew that I wanted to launch businesses that were in the technology space. And so fast-forwarding after my first business, which we raised a bunch of money around and it ended up not working out, I decided to go back and finish my degree. TYLER: Yeah. Exactly. Just, you’d stop and think for 10 seconds and it’s like well, how do you solve that problem? It’s not doable, it's too big, it's too complicated, there are too many underlying problems. So the whole class for the entire semester is about challenging that really quick conclusion that people tend to draw about these things and start to break down these really big problems into maybe smaller and smaller parts and try to really find those root causes if you can. And then maybe try addressing the root problem. Don’t try to solve the big big problem but maybe try to solve a small part of one of the root problems, and that will start to make the problem go away. And so — this is a long-winded intro to the whole thing — but it turns out blockchain (and a lot of other things like artificial intelligence, internet of things, the internet in general), but blockchain specifically is one of those technologies that when you really think about it for a little bit, and what it does and what it means, you can envision a lot of these really big problems in the world starting to become not so big because some of the root problems are actually solvable with a blockchain solution that achieves critical mass. And so that, for me, is why I am so interested in Very becoming very deep in blockchain development and getting involved and meeting with really interesting people who are trying to use blockchain to solve all kinds of problems around the world. Because I genuinely believe that in the next two or three or four years, some of these things will take hold, and we’ll start to see some really big problems on this planet start to not be problems. And I just want to be involved with it, and if we can be even a small part of that whole process and the energy that’s going into it, that will be a very fulfilling thing. EMILY: Yeah, that makes a lot of sense. I’m definitely interested for a lot of the same reasons and also just because — so I got into tech marketing because I just love the pace of change. There is always something different that needs to be fixed or solved or thought about in a unique and different way. And then I see with blockchain that that pace of change is so much faster than technology in general. I was at a conference in Nashville about blockchain, and they were saying that it’s almost like dog years — like one year of normal innovation is like seven years of blockchain innovation, can do the same amount of just transformational work. So it seems like an area where there's so going to be so much change so quickly, and I think it could be really exciting for us to be along for the ride. TYLER: Yeah, I completely agree, it’s moving really fast. In fact, it’s moving so fast right now that blockchain developers, there are bunch of different anecdotes as you talk to people about it, but the demand for developers for a variety of these projects is just so over the top. Blockchain “development” started in about 2015 with Ethereum coming about, where the reality of using blockchain to do more complicated computation and create decentralized applications and different things like that. Not just Bitcoin, not just moving money around, but doing more complicated things — that’s only been around since 2015. It’s 2017 now, so it’s been here for two years, but the explosion of ideas that have come out of that, which has also been fueled by ICOs and some other things that we can talk about in various points along this podcast — it will inevitably happen because so many people are doing them. But you know, it’s not uncommon right now that somebody with a year of blockchain experience is getting a $300,000 job offer base salary, plus equity, plus you know, whatever else — because the demand is so huge for people that know at least how to play around in the space and build some stuff. So it’s an exciting time, and it’s kind of a scary time as an employer of engineers because that kind of salary is astronomical and difficult to manage, but it’s just an illustration of how fast things are moving. Another example is Bitcoin in general. The price of Bitcoin since 2009, when the first one was mined, the genesis block was mined, they traded back in 2009 at about a tenth of a cent per Bitcoin. And now, whatever, eight years later, today it just hit $6,000 per Bitcoin. So you’re talking about six million percent appreciation in eight years, and that's just one thing. That’s just currency powered by blockchain. So you know, the speed with which this thing is moving is really astonishing and that’s part of why I like the idea of approaching this from a consulting standpoint and having a business that is going to touch multiple blockchain projects because it is really moving so fast that it will be difficult to predict any one project working out. In 18 months, after you start working on something, something completely different may have made it irrelevant. So it’s difficult certainly from a business standpoint to think about blockchain. But from the societal implications, and what it means for the internet and for technology in the future, it’s just — it’s a really exciting place to be. So, a little more about this podcast. So what I’m hoping to achieve here with this podcast is to focus on the problems in the world. Going back to that “solving big problems” class. Focus on problems that are in the world today. Maybe talking about some of the history of those problems, some of the people that are involved with it. What nations are involved, whatever it happens to be, and go into real detail about why these problems exist and what the core of the problems is and how it affects people. We’ll talk a little bit about hyperinflation today. It’s just one small example of — it’s a huge example, but it’s just one example of what something like Bitcoin has the potential to solve, what blockchain has the potential to fix. So the podcast itself, in terms of format, we’re going to probably focus on one problem every single episode. I hope to go into some real detail about it and maybe spend five or 10 minutes just going into the history of these problems and painting a picture of just how big and how grave they are and how much pain they cause, only for the purpose of illustrating why blockchain matters as it relates to that problem. And then bringing in some guests that are really smart people who are in the process of building their own blockchain solutions, probably on top of Ethereum, but there are all kinds of other ways they can do it. They can do it on Hyperledger, they can do private blockchains, there are public blockchains that are all over the place. I don’t know exactly which direction the industry will go or how quickly it will pivot, so no fundamental commitments there, but generally, bringing in people who are actually working on solving these big, hairy, nasty problems with their blockchain solutions. And then maybe getting a little bit into the technical side of things. But this podcast is not going to be focused on the tech. It‘s not going to be focused on the underlying tools that enable blockchain. We’re not going to go deep into cryptography. We’re not going to go deep into network theory or anything like that. Those are very interesting topics. I’m not personally qualified to go very deep on any of these topics. They’re are hard. I mean they’re really difficult. If you know nothing about blockchain and start reading about it now or watching videos about it and really commit an entire day to learning about it and trying to understand it — I suspect unless you are a very, very deeply intelligent person that just picks up things super fast, you’ll have a decent picture of what are the edges of this thing and kind of how it works and how it smells and you know, you’ll understand a little bit about proof of work and how that applies to, you know, the continuity of the blockchain and what mining is and all these different kinds of things. But it will still be a very fuzzy understanding of what blockchain is. Because of that, it’s really hard to wrap your mind around what are the implications of a thing that you don’t really fully understand. And I don’t fully understand it. Emily doesn’t fully understand it. But that’s okay because it’s evolving anyway, and we’ll all learn together as we bring in some smart people that will talk about it. EMILY: So let’s talk about hyperinflation. TYLER: Yeah. Hyperinflation. So this will be a good starter example. So hyperinflation, for those of you who don’t know, is what happens when a country starts printing money out of control. It typically only happens in times of war. Civil war or otherwise. It does happen in other circumstances where there’s just horrible economic problems, but most of the time the biggest examples have to do with war. And what it basically means is that the value of a currency, whatever the currency that that nation uses, whether it’s the Mark for the German Weimar Republic, the Zimbabwe dollar, etc. The value of it drops so rapidly that in some cases, if you get a paycheck one day, if you don’t spend that paycheck on the things that you need within an hour, the value of that paycheck — you can no longer buy the stuff that you could have one hour ago. It can be that exaggerated. 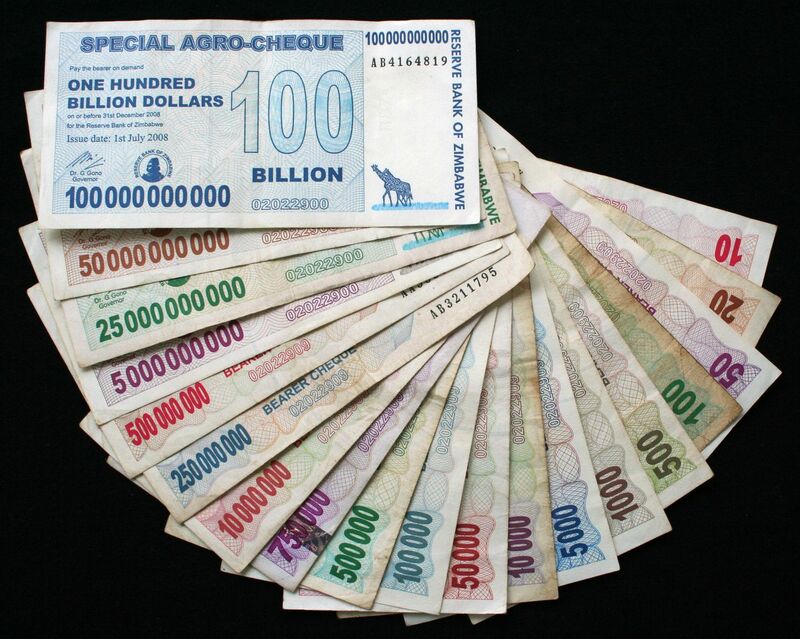 Zimbabwe currency ranging from $10 to $100 billion, which were printed within a one-year period. This sounds like a really foreign concept in the United States — like, man, things have to be really messed up somewhere, this must be a pretty rare thing. And it’s true in the United States, we haven’t experienced hyperinflation, except there were a couple of times, where, you know, the value of the dollar dropped really, really aggressively twice in the 1800s, but nobody is alive today to have experienced the effects of hyperinflation. In general, the United States enjoys an extremely strong currency. Ever since the end of World War II, the U.S. dollar was the dominant currency around the world. Almost all the international trade happens in the U.S. dollar. So we have this really unusually powerful currency, and it means basically nothing to anyone here. Because it doesn’t mean a whole lot when you’re exchanging goods and services inside the U.S. for dollars, which is what we all do, but when you’re talking about international trade, it has a huge huge effect, and it puts basically any other country at a big disadvantage. But anyway, hyperinflation nonetheless is something that is a real, real problem. Right now, in Venezuela, there’s all kinds of civil unrest because of a regime change basically. Hugo Chavez brought a socialist regime with the United Socialist Party into Venezuela, and now there’s a new president, Nicolas Maduro, and there’s all kinds of civil unrest for a variety of reasons. But at the core of it, Venezuela is an oil-producing country, and 95% of all the export revenue that comes into the country is oil revenue. The price of oil has dropped really, really markedly over the past handful of years. And so, a lot of the socialist programs that are very expensive to run, national health care or whatever it happens to be, are too expensive to run because there’s not enough revenue coming in. As a result, in order to pay for these things, the country starts printing lots and lots and lots of money because that’s the only way to pay its obligations. That can fuel the unrest very easily because hyperinflation causes all kinds of problems. But what it basically means is, you know, the value of everything that you’ve worked for, (except for people who maybe own businesses or happen to be very wealthy and have all of kinds of assets and they’re distributed), but the vast majority of people, most of the citizens, the value of what you’ve earned over your lifetime goes to zero or drops very, very precipitously. So that’s affecting 31 and a half million people right now. EMILY: Well and even so much beyond that — what if your parents or your grandparents and everyone that you know, all the things they worked toward their whole lives is just gone. EMILY: Yeah, and there’s nothing to buy. EMILY: How often does this happen in different countries? 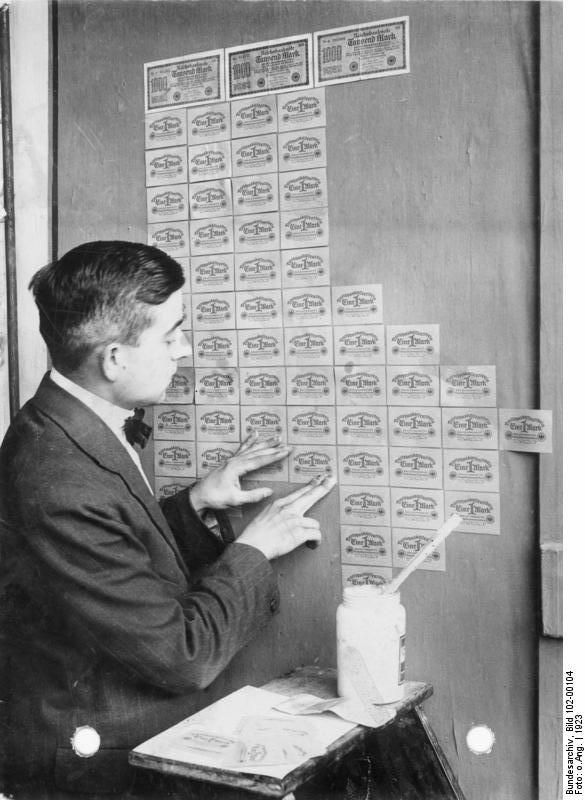 In Germany in the 1920's, banknotes had lost so much value they were used as wallpaper. TYLER: It happens a lot more frequently than people realize. This sounds like something that’s like, wow, okay, so one country is experiencing it, this couldn’t have happened — probably World War II is the last time this happened. But you know, just previously to this, Zimbabwe was going through an extremely aggressive period of hyperinflation. In November 2008, Zimbabwe reached a peak inflation rate of 79.6 billion percent. EMILY: You can’t even imagine what that is. TYLER: Yeah. The value of all the money just goes to zero basically. In no time flat. And that had to do with war. There was a war with the Congo. But you know — that’s another example. It turns out that there are 22 examples of countries going through periods of hyperinflation, just in the last 25 years. So every 14 to 15 months on average, an entire population of people, tens of millions of people, everything they’ve earned goes to zero because of bad actors in the government borrowing way more money than they can ever possibly repay. You know, they’re going to war for whatever reasons. Sometimes they’re legitimate reasons, sometimes they’re just silly. But at the end of the day, this is a real problem that happens all over the world and it has to do with fiat currency. It has to do with the fact that money, paper money, has no implicit value. It says backed by the full faith in government — whatever it states on the U.S. dollar — essentially every country has a version of that on their currency. People are putting faith in the government to protect the value of the currency, and they fail to do that. And this fundamental problem that there’s a central authority, which is the government, the central bank, they are the ones with all the power. They are the ones that make all of the decisions, and they have this huge responsibility to be good actors in the interest of their citizens. Everything works just great as long as that central authority is doing what it’s supposed to do, it’s functioning in a healthy way. But the minute you have a corrupt person in there or there is some set of circumstances that is beyond the control of that central authority, some other country gets involved or there’s a war somewhere, there’s a massive drought, you can’t produce enough oil, the price of oil collapses. Some external factor comes into play, and then suddenly that central authority becomes unstable, they become unreliable, and they start breaking all the rules. And all of these citizens are beholden to it and there’s nothing they can really do. And so, why are we talking about this? Well, one of the fundamental aspects of Bitcoin is that it is mathematically limited to — there will never be more than 21 million Bitcoin on earth, or beyond earth, I suppose. Or anywhere on the internet, ever, based on how it works. Basically, there’s a certain amount that is created every 10 minutes as a block is created on the blockchain — and we are not going to get into the details of how that stuff works. But a little bit is created every 10 minutes in exchange for people essentially auditing transactions on the block. People that are auditing, they are doing something called mining blocks, and in exchange for mining a block, which takes a lot of computation, you are rewarded with a little bit of Bitcoin. And the amount, every 2,016 blocks that are mined, a little bit less Bitcoin will be available in a subsequent block. The way the math works out, sometime in the mid-2040s I believe, would be the last little bit of Bitcoin that gets mined, and there will be exactly 21 million Bitcoin in circulation at that point. Anybody who is using Bitcoin as a currency knows that. They know that there’s at least a certain degree of absolute trust in Bitcoin in so far as it will never hyperinflate. The value of the coin can never drop on account of somebody just producing it in indiscriminately large amounts. Nobody can just suddenly create a hundred million Bitcoin and then the value of all of it disappears. There’s trust that if I have one percent, or .1% of all the Bitcoin, I will always have .1 % of all the Bitcoin. Which is extremely powerful because since there’s no central government that’s running it, since there isn’t a nation, there isn’t an army that needs to be fed — there isn’t anything that is fundamentally tied to that currency and there’s no decision-maker that is capable of changing the rules of how that currency works, it doesn’t play by the same rules as every other nation’s currency. The same risks that come with holding U.S. dollars or Zimbabwe dollars or Swiss francs or British pounds or whatever it happens to be. Those risks simply aren’t there with Bitcoin. TYLER: So that’s a great question, and it gets into how the network of nodes (so a node is one of these mining actors, essentially) — the computing power that goes into auditing and verifying a block of transaction, so those new transactions are pouring into the network. People are exchanging money through their wallets, exchanging Bitcoin. Those transactions go into blocks and all of these different miners around the world, people with computers, are racing to create this block, and again, this is going into this proof of work thing and there’s all this hashing stuff that goes on. It’s a really interesting topic. But basically the beating heart of Bitcoin and the auditing and the consensus and the trust are all these computers, and they are all over the world. EMILY: So are they, each time they are auditing things, also checking to make sure that the rules haven’t changed, if you will? Or not necessarily. EMILY: To agree? Basically come to a consensus on it. TYLER: Yeah. Basically needs to agree on one direction or another. Yes, we’ll take this. No, we won’t take this. And sometimes there are major disagreements where not 51% are interested in accepting a certain change to the code, and so you can get these things called forks. And something occurred recently where a new currency was created that split off of the main Bitcoin blockchain, it’s called Bitcoin cash. Basically there was a disagreement about how to handle a particular bottleneck in processing transactions in this huge network. This is getting into some of the details, it will start to get really heady, but basically, the size of a block that can be mined is limited to one megabyte, or was limited to one megabyte. That was fine years ago, when Bitcoin wasn’t very big, the block wasn’t very long, and so the size of the block didn’t matter too much. A megabyte seemed like a huge amount of transactions. But nowadays, there are ten million transactions per month of Bitcoin transactions and that number is increasing geometrically. So, what started to happen is that became too small and so the amount of time it took to process the transaction was starting to get kind of crazy. You know, hours and hours and sometimes days for a transaction to go through, which is not a great thing, you know, when you are talking about wanting to buy something at a store. Nobody wants to sit around waiting, two or three hours, you know — is my coffee paid for yet? TYLER: Yeah. So, under normal circumstances, the block would just kind of go with the majority and the rules would be accepted by the majority and that would be the end of story. But some people, some of the miners, some of the players that are involved believed so strongly that it really needs to be this way, that they just decided to fork off the main block. They still want to use the data that’s been — the ledger that’s been created up until now. But they don’t want to participate with the same, with the bulk of people. They don’t want to go with the majority. They want to go by a different set of rules, and so they forked off and they started their own thing. EMILY: So, does that technically count as a different currency? TYLER: Yeah. The rules are changing all the time with it because new code is being integrated. How do you put your faith in this thing? It is a legitimate criticism and a lot of people are really, really upset that these sorts of forks are a possibility, but it’s happened with Bitcoin, it’s happened with Ethereum. I think just very recently, another fork happened with Ethereum, something called the Byzantium fork, and so a whole new currency gets created. And it happened in the past with the Ethereum. And so that created Ethereum and Ethereum classic. It actually is very deeply confusing, and it does create all kinds of problems. When you are talking about a global audience of major decision makers and major money, they want to understand fundamentally what it is they are looking at. They don’t want it to change after the fact. So that’s an issue with Bitcoin, and it will be for cryptocurrencies into the future. But that’s just one issue, the cryptocurrencies. You can also just create cryptocurrencies as you see fit. We could create our own cryptocurrency tomorrow and call it Very Bucks or whatever it happens to be. And there it is, that’s our currency. It could work exactly the same way as Bitcoin. In fact, you could just copy the source code for Bitcoin and rename some stuff, and boom, we’ve got our own blockchain and it’s rolling. No one would use it, but you could do that. But this problem with hyperinflation is potentially seriously combatted if you just ignore all these other things. Ignore things like forks. Ignore other cryptocurrencies appearing. If you just assume there’s only one cryptocurrency like Bitcoin that is accepted by businesses all around the world, whether you’re in the United States or you’re in Brazil or Japan or China or whatever it is. If you want to purchase things, if businesses of all kinds are accepting Bitcoin, and Bitcoin is fundamentally limited to 21 million, if that continues to snowball to the point where everybody accepts it, you kill hyperinflation forever. Literally, there’s no longer a means of doing it if all of your money is in that thing. Now, there’s a lot of reasons why that may never happen and probably won’t ever happen, but still, the underlying technology, blockchain, enables that, which is kind of cool. Which is really cool, honestly. Anyway, that’s one example. There are a lot of other really huge root-cause issues that are tied into that, having to do with central authorities, having to do with central banks not playing nice, having to do with banks in general being profit-oriented, that we can talk about in other episodes, so that this doesn’t get too crazy. But there are all kinds of other non-currency, non-money applications of Bitcoin now that can target all kinds of other really exciting problems, terrible problems, but the prospect of solving them or addressing them in a new way is really, really awesome. So, I think that’s probably good for today. TYLER: We’ve got a handful of different guests that we can bring into this. We don’t know just yet what the order will be. I think what we’ll try to do is record one of these every couple of weeks. We’re really excited about it. EMILY: Yeah. And if you guys have topic ideas, big problems that you’re seeing solved with blockchain technology, let us know. We’d be interested to add to our list of potential guests. EMILY: Yeah. Thanks, Tyler! I’m excited. Don’t miss the next episode of the Chain Reaction podcast. Subscribe on iTunes, Google Play, or Stitcher.